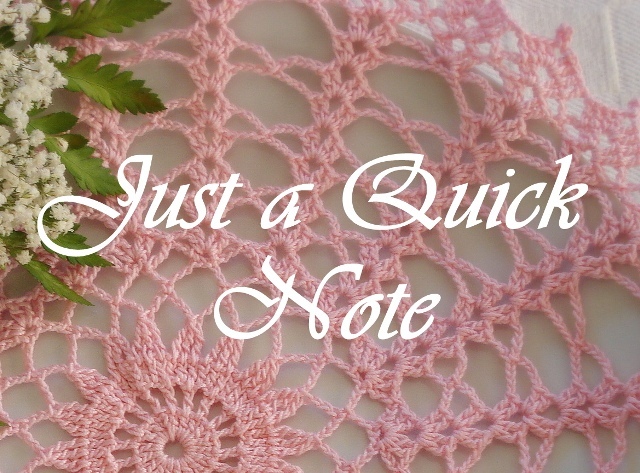 Here is another doily that I’m not sure whether I should keep or unravel it. As you can see in the picture, I didn’t cut off the thread yet. 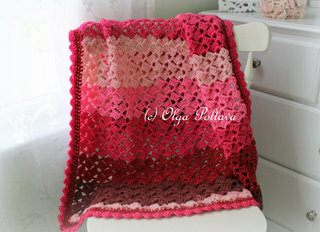 I liked the original pattern and it was easy to crochet. But for some reason, it ruffled way too much. 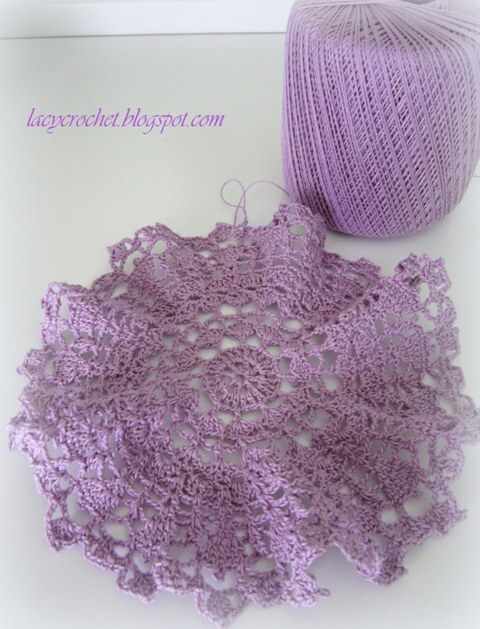 Usually a bit of ruffling is not a problem and a doily would straighten when blocked. I haven’t blocked this doily, but I am sure blocking wouldn’t solve the problem. On the other hand, it does look unusual and somewhat cute. 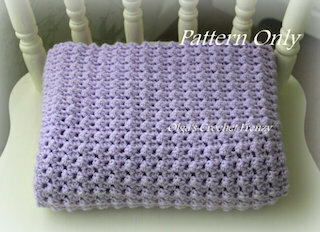 The original pattern was from Panda Crochet. 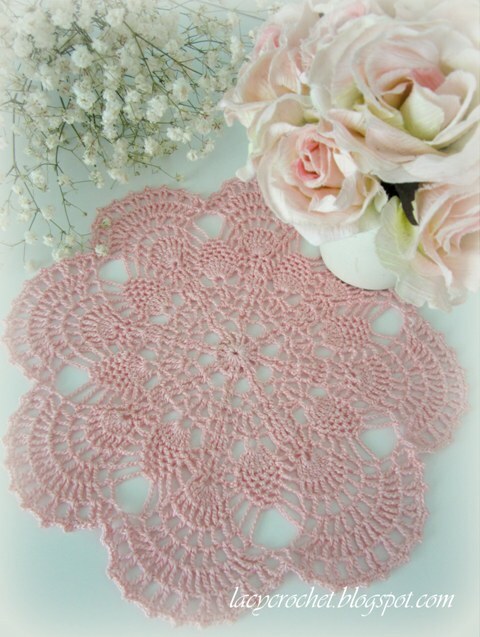 It’s called Small Exchange Doily (see in the list of free patterns) and it was very pretty in the original pattern. Too bad mine didn’t work out! 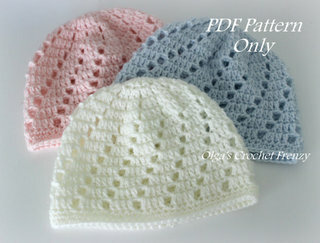 Unfortunately, the link to the pattern doesn't work anymore. 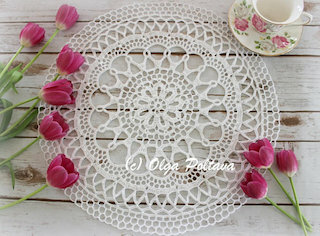 First of all, I want to thank you for your comments and replies regarding the previous doily. I decided to keep it! And now I want to share my new pink beauty. I don’t have questions about this one. I love it! 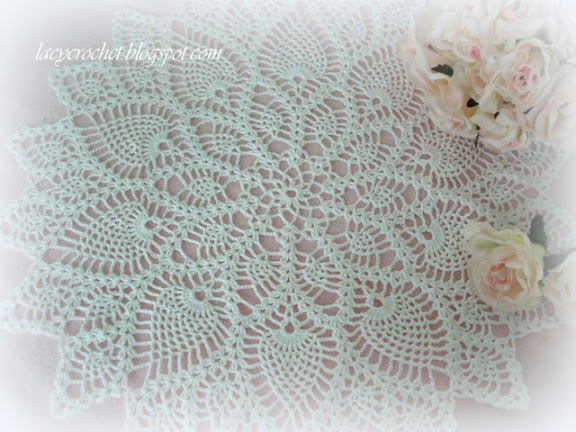 pineapple doilies, and this is only one of them (I hope to make the other two as well). The doily in the pattern was done in yellow, but I picked pale pink for mine. 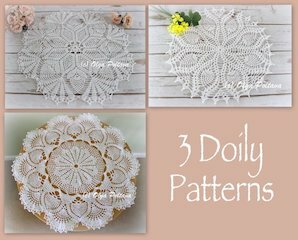 The doily has 15 rounds. I used size ten crochet cotton thread and my doily came out about ten inches in diameter. 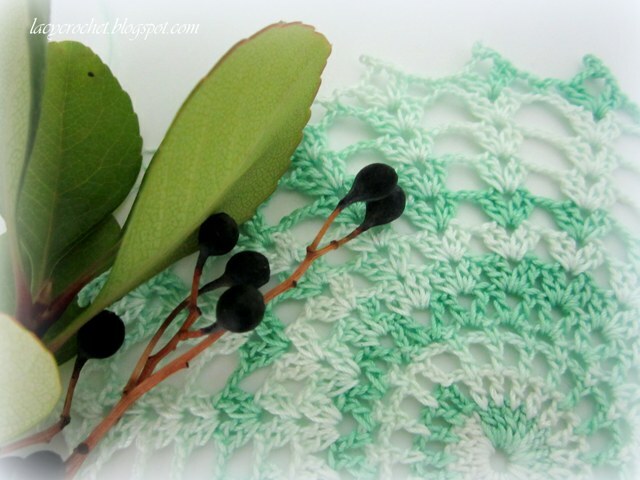 A few weeks ago a picked up a roll of green and white multicolor crochet thread from a Goodwill store for only 49 cents. And out of that thread came this small doily. I’m not sure if I should keep it or rip it. I think it would’ve looked much better in solid color. With the multicolor thread, the design is not very visible. But I can’t really think of anything this thread would work well for. 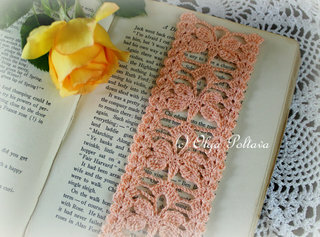 Perhaps a bookmark? I used a free pattern from the Internet. 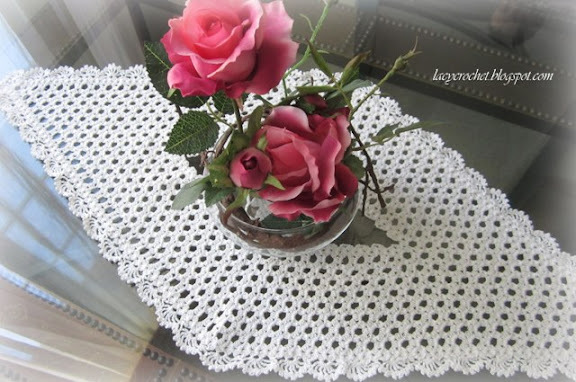 I added a few more rounds (by increasing the chain space by one in each consecutive round) because otherwise the doily was the size of a coaster. 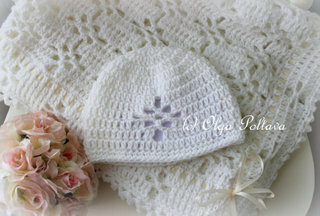 I want to sincerely thank all of you who entered my giveaway. With the help of random.org, the winner is now known! It is Mcobb10, who wrote in the comments: How beautiful! I would love to win this! 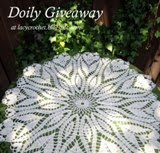 If you really liked this doily but didn’t win, do not despair. It was fun for me to host this doily giveaway, and I do have a lot of doilies, so there will be other doily giveaways on Lacy Crochet in the future! 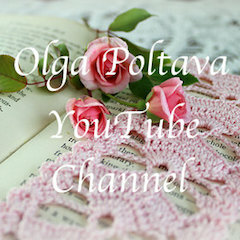 I just wanted to let you know that I am going away for a couple of days and I won’t have access to the Internet. 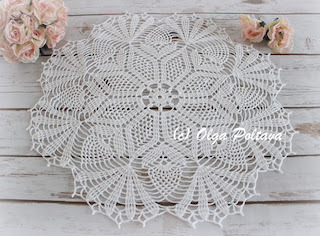 I will come back Sunday evening and that’s when I will announce the winner of the doily giveaway! My doily post is late this week because my baby got sick last weekend. I couldn’t think of anything other than my poor child. He is better now though not completely recovered yet. 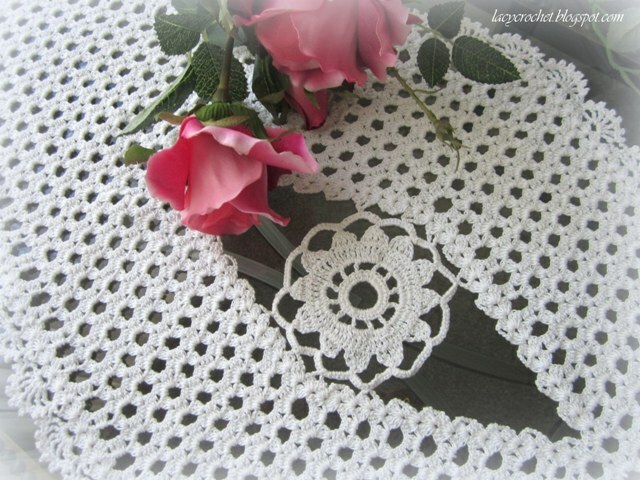 I got this doily from my mom. She doesn’t like it and was going to rip it, so she could use the thread to make something else. I didn’t want the doily to be ripped and asked her if I could have it. 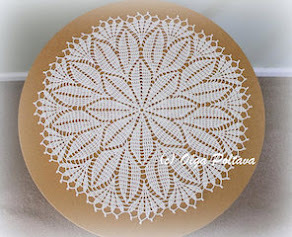 I have tons of my own doilies, but most of them are round ones and I liked the unusual shape of this one. Of course, my mom let me have it. 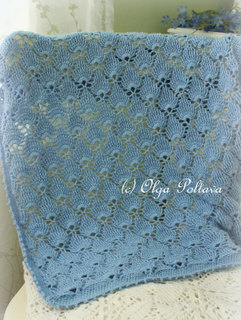 Here is what it looks like in the middle. I don’t know where the pattern came from. 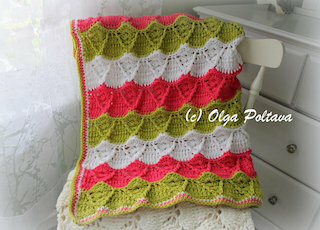 I suppose it’s from one of my mom’s Russian crochet magazines. 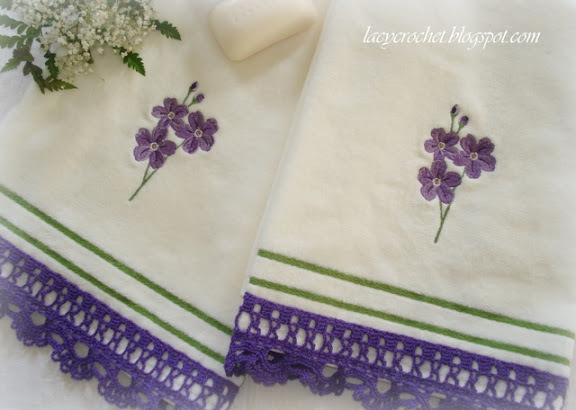 Today I just want to share an idea how to embellish towels with crochet lace. 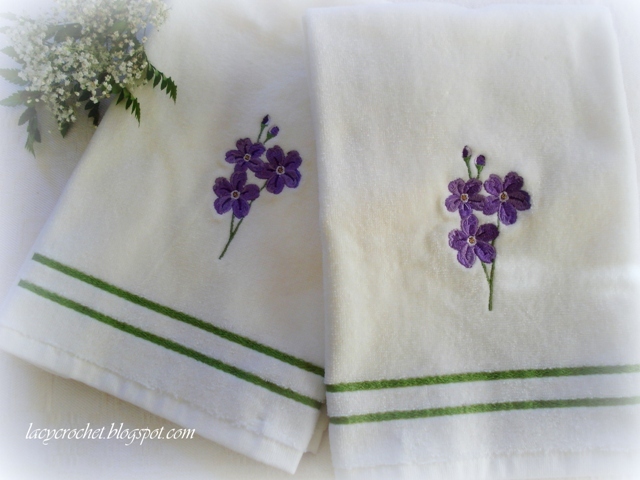 I added the lace to these hand towels last year. 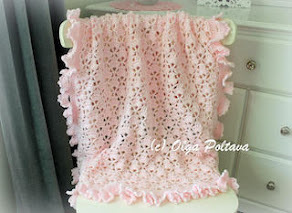 I remember I found a few patterns for crochet towel edgings on the Internet, but when I tried them I didn’t like any. So I just came up with my own pattern. Unfortunately, I don’t have it written down. 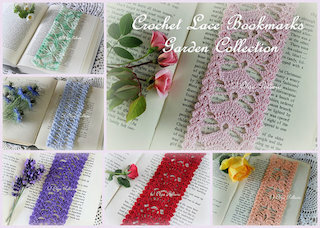 I crocheted two strips of lace and then used a sewing machine to sew them on the towels. 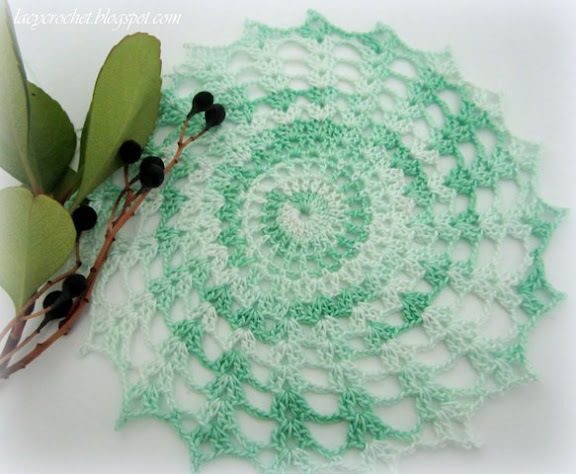 I made this pineapple doily last year. Unfortunately, I didn’t bookmark the site with the pattern (back then I didn’t write my crocheting blog, so there was no need for it), and now I can’t find it. 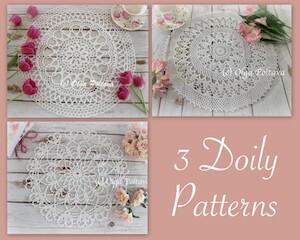 And I don’t even have the doily anymore. I sold it on Etsy. What is left is just a photograph.